"Dirty Dozen" of tech titans who kicked out tenants includes a Google lawyer. 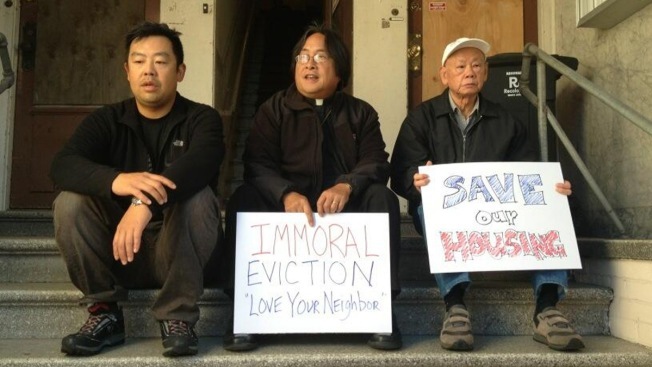 Tenant activists outside the Lee family's old home in Chinatown. Landlords across San Francisco are on a list of a "dirty dozen" users of the Ellis Act to evict tenants. In the ongoing housing rights battle that's raging in San Francisco, one side is naming names. The Anti Eviction Mapping Project unveiled this week its "Dirty Dozen" list of landlords that have filed eviction notices against longtime tenants -- and on the list are more than a few folks who have purchased their real estate holdings with tech cash. Google executives as well as CEOs of lesser-known companies are all on the list, according to Reuters. Ellis Act Legislation Aims to Restore "Original Intent"
and Googlers Thomas Fallows and Kansinee Adsanatham Jung. Tech workers, fairly or unfairly, have been a frequent target of anti-gentrification ire. Tech buses have been blockaded by angry tenants and workers as real estate prices grow ever higher in the Mission District and other areas close to the bus routes.